Hendrik Goltzius, a brilliant printmaker, draftsman, painter, and the head of a workshop that dominated Dutch printmaking during the late 16th and early 17th centuries, is the first name most people think about when they think about the Dutch Mannerist movement. As the recent travelling exhibition at the Rijksmuseum, Amsterdam, The Metropolitan Museum of Art, New York, and The Toledo (Ohio) Museum of Art (and the massive accompanying book, Hendrick Goltzius (1558-11617): Drawings, Prints, and Paintings by Huigen Leeflang, Ger Luitjen and others, make clear, Goltzius, "favored by an emperor [Rudolph II] and other European sovereigns" is a artist of "exceptional versatility, quality, and importance" (p.6). As an engraver, his technique was unmatched; as a designer of prints and a draftsman, he offered the definitive version of Dutch Mannerism; and his drawing-paintings filled his contemporaries with admiration and sill overwhelm viewrs (as the exhibition proved). 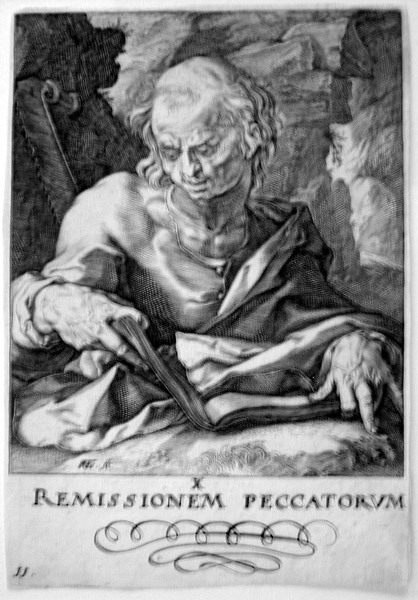 His designes for Ovid's Metamorphoses, engraved by members of his studio, set a pattern that dominated Dutch art into the mid-17th century; his engravings of the 12 apostles, each presented either with his attribute (St. Peter and his keys, St. John with his cup, St James Major with his pilgrim's staff, the other apostles with the means of their martyrdom) and a clause of the Apostles' Creed engraved underneath their half-length portrait, to which Goltzius then added Chirst as the Salvator Mundi and St. Paul, the defender of the faith, also became a model for a number of other artists; and hisengravings for the Passion recapitulate Northern printmaking from Durer and Lucas van Leyden until Goltzius' own works. St. Thomas (Bartsch 50, Strauss 274 v/vi). Original engraving, 1589. 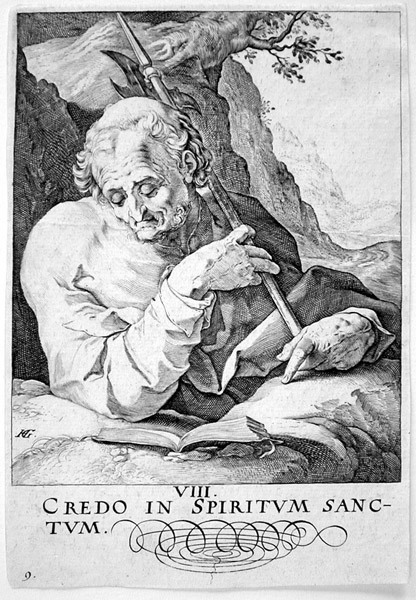 Plate 8 of 14 devoted to the Creed. Strauss suggests that "Goltzius' apparent aim in this series was to portray as many different facial and character types as possible. Except for Christ and St Paul, who were subsequently added to the series, the order of the prints is established by the words of the Apostles' Creed inscribed in the bottom margin of each." Signed fecit" in the plate, numbered bottom left margin. Good impression trimmed on or within the platemark. Image size: 120x99mm. Price: sold as a set of 14 for $21,000 (complete sets are quite rare). Also available: a beautiful impression from the third state. Provenance: Gustav Seeligmann (Lugt 1215; collector's mark verso). Price: $4500. St. Matthew (Bartsch 51, Strauss 275 v/vi). Original engraving, 1589. Plate 9 of 14 devoted to the Creed. Strauss suggests that "Goltzius' apparent aim in this series was to portray as many different facial and character types as possible. Except for Christ and St Paul, who were subsequently added to the series, the order of the prints is established by the words of the Apostles' Creed inscribed in the bottom margin of each." Signed "HG" in the plate, numbered bottom left margin. Good impression trimmed on or within the platemark. Image size: 121x100mm. Price: sold as a set of 14 for $21,000 (complete sets are quite rare). St. James the Lesser (Bartsch 52, Strauss 276 v/vi). Original engraving, 1589. Plate 10 of 14 devoted to the Creed. Strauss suggests that "Goltzius' apparent aim in this series was to portray as many different facial and character types as possible. Except for Christ and St Paul, who were subsequently added to the series, the order of the prints is established by the words of the Apostles' Creed inscibed in the bottom margin of each." Signed "HG" in the plate, numbered bottom left margin. Good impression trimmed on or within the platemark. Image size: 121x100mm. Price: sold as a set of 14 for $21,000 (complete sets are quite rare). 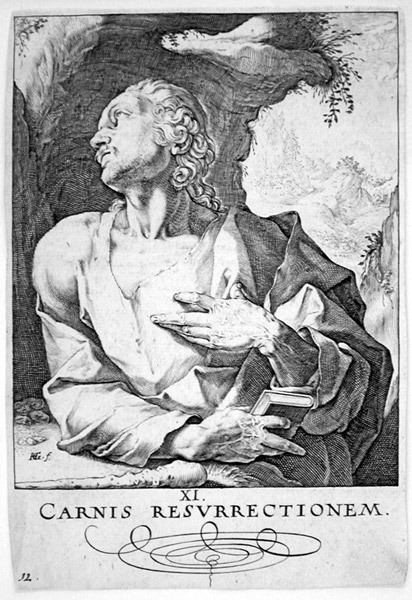 St. Simon (Bartsch 53, Strauss 277 vi/vi). 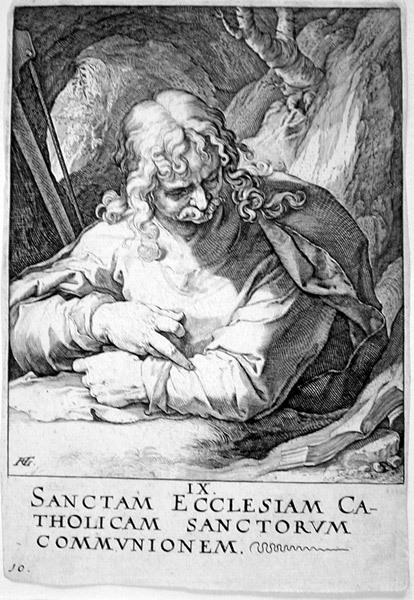 Original engraving, 1589. Plate 11 of 14 devoted to the Creed. Strauss suggests that "Goltzius' apparent aim in this series was to portray as many different facial and character types as possible. Except for Christ and St Paul, who were subsequently added to the series, the order of the prints is established by the words of the Apostles' Creed inscribed in the bottom margin of each." Signed "HG fecit" in the plate, numbered bottom left margin. Good impression trimmed on or within the platemark. Image size: 120x99mm. Price: sold as a set of 14 for $21,000 (complete sets are quite rare). 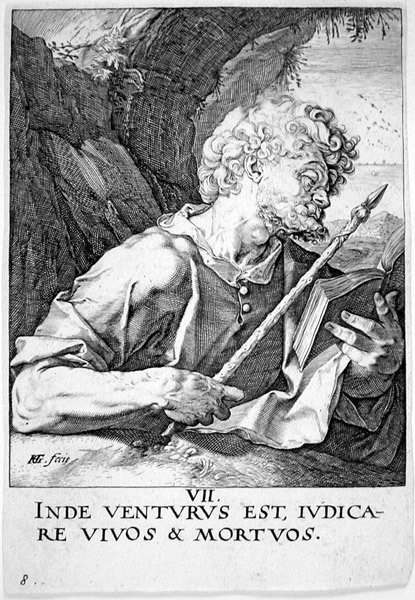 St. Jude (Bartsch 54, Strauss 278 vi/vi). Original engraving, 1589. Plate 12 of 14 devoted to the Creed. Strauss suggests that "Goltzius' apparent aim in this series was to portray as many different facial and character types as possible. Except for Christ and St Paul, who were subsequently added to the series, the order of the prints is established by the words of the Apostles' Creed inscribed in the bottom margin of each." Signed "HG" in the plate, numbered bottom left margin. Good impression trimmed on or within the platemark. Image size: 121x99mm. Price: sold as a set of 14 for $21,000 (complete sets are quite rare). 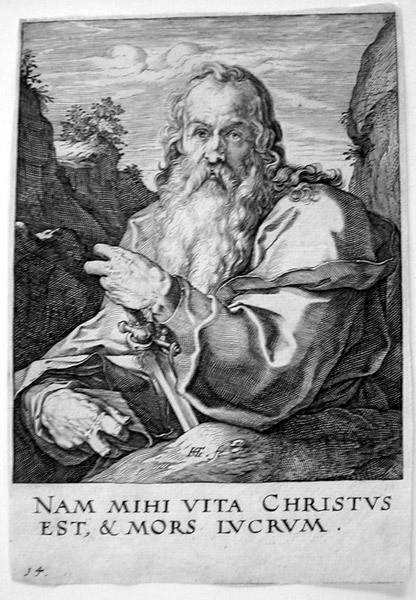 St. Matthias (Bartsch 55, Strauss 279 vi/vi). Original engraving, 1589. Plate 13 of 14 devoted to the Creed. Strauss suggests that "Goltzius' apparent aim in this series was to portray as many different facial and character types as possible. Except for Christ and St Paul, who were subsequently added to the series, the order of the prints is established by the words of the Apostles' Creed inscibed in the bottom margin of each." Signed "HG" in the plate, numbered bottom left margin. Good impression trimmed on or within the platemark. Image size: 122x100mm. Price: sold as a set of 14 for $21,000 (complete sets are quite rare). Also available: a beautiful impression from the third state. Provenance: Gustav Seeligmann (Lugt 1215; collector's mark verso). Price: $3000. St. Paul (Bartsch 56, Strauss 280 vi/vi). 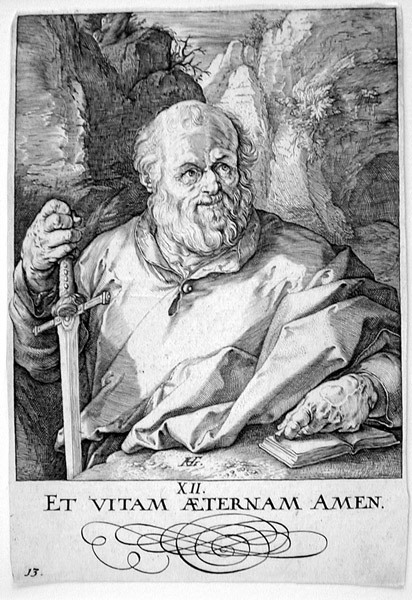 Original engraving, 1589. Plate 5 of 14 devoted to the Creed. Strauss suggests that "Goltzius' apparent aim in this series was to portray as many different facial and character types as possible. Except for Christ and St Paul, who were subsequently added to the series, the order of the prints is established by the words of the Apostles' Creed inscribed in the bottom margin of each." Signed "HG fe." in the plate, numbered bottom left margin. Good impression trimmed on or within the platemark. Image size: 119x98mm. Price: sold as a set of 14 for $21,000 (complete sets are quite rare).